Steel Prophet's sci-fi-themed Omniscient has been a long time in coming, to put it mildly; the first song was reported by the band in 2007...in 2011 they said they were partway done...now, finally, we get an album from them that promises to be a return to form. Although Rick Mythiasin is back on vocals, they still haven't recaptured the fierceness of albums like Messiah, but this one is quite respectable and an improvement on both the mediocre Unseen and the albums of the Nadir D'Priest days. With the album comes a whole illustrated story, that ties the songs together and provides lyrics (my copy only has the text). With the return of Mythiasin, the band's sound that calls to mind something from Iron Maiden's Brave New World album is back in action. Trickery of the Scourge has Mythiasin's Dickensonian vocals hitting some high notes, but considering this is the first song on the album, it's mid-tempo in pace and doesn't have much of the NWOBHM speed that was so enjoyable in earlier albums. This changes with When I Remake the World, a relentlessly pounding piece that combines a strong melody with Steve Kachinsky's outstanding guitar work, and 911, which has more of a thrashy sound to it. I'm not normally a big fan of songs with a political/current events bent to them, but this one's not particularly preachy and just focuses on the conspiracies and uncertainties surrounding the event in the title, and Mythiasin's vocals, which get harsher and more declamatory on the verses, make this a favorite song of mine. Also excellent are Chariots of the Gods, whose thuddingly emphasized chorus melodies, NWOBHM-style drumming, and rather indulgent soloing are quite catchy. The first part of the album is the best part, in my opinion. The combination of NWOBHM melody and thrash fury has always been where Steel Prophet has shone, and their clever lyrics are worth a listen to (quick, how many metal references can you find in 911)? Sooner or later, though, they take it over the top. 666 Is Everywhere is enthusiastically handled by Kachinsky and Jon Paget's two-guitar attack, with some extra screams from Mythiasin, but it starts getting silly quickly, though I'm sure it's intended to be tongue-in-cheek, and Oleander Deux is a minute and a half of the listener waiting for the band to get done having fun and get on with the actual music. Through Time and Space relies a bit too much on crooned vocals and a bit too gentle an approach to a song that the band would ordinarily have just killed -- now it feels like they're pulling their punches a bit. Transformation Staircase, while not having a particularly exciting melody, does have beautiful instrumental work, and I should note that John Tarascio's drumming on this one is a particular standout. After a reasonably well-executed bonus cover of Bohemian Rhapsody, the second bonus track, 1984, is a rough, short, but much fiercer song, sung with a rapid, almost punk-style delivery, and definitely heavier than almost any other track on the album. I can't help but wish that some of this fire had made it to more of their other tracks. I also wish I didn't have to report on the written "story" that comes with the album, which is probably the most awkward part of the whole thing and illustrates clearly why most musicians should just stick to playing music. There are some good concept album stories, but this one's as painful to read as a My Little Pony fan fiction article. 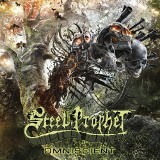 Omniscient shows Steel Prophet going in a decent direction, though a lot of the old fire is still somewhat banked down and it would be great to see that again, just as I wouldn't mind never seeing a storybook come with one of their albums again. They haven't lost their progginess or their ability to write a good riff, though. Most fans of their past work will probably like Omniscient, but casual listeners probably won't care much for this one.